Yesterday, I reviewed the new do-all Cosmo bag from Amy Michelle. Today, you have the chance to win another one of their do-all bags – the Madison Avenue Tote in Candy Apple Red. 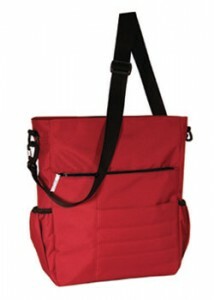 Wear it as a sling, messenger, backpack or hook it onto your stroller or luggage. For work, travel, baby, school or play, the casual Madison Avenue tote is a perfect solution for all the places the day takes you. Contest ends Friday, May 13th at 11:59 pm. Open to US and Canada residents only. No PO boxes. Wow we’d take it everywhere…..the Zoo, the Aquarium, Grandma and Granpa’s, Vacation you name it. Sounds like a great product. My do all bag needs to like traveling ;). I always purchase big bags because I carry a lot of items around, I have a 2 year old and am about to give birth again so traveling light is never an option. I also walk daily so need a bag that is both attractive and functional. My bag needs to go everywhere I do…school, grocery store, baseball fields, beach. It is so cute…I really need a new bag. My diaper bag is 3 years old at this point and on its last leg! This bag looks like the perfect size to fit in my itty bitty stroller basket so it would go with me anywhere I took the stroller out: the mall, park, museum, etc. My do-all bag needs to go everywhere with me! To the grocery store,the stadium,the park,friends,mall,everywhere!! The park, shopping, farmer’s market, outings it’s so cute I’ll take it everywhere! I would take this everywhere – park, trips, library, hiking, in the stroller, etc. etc. Thanks for the chance! Following Mommies With Style on facebook.. Following Amy Michelle on twitter….